Every year on the 14th of October, the Romanian Orthodox Church commemorates our Venerable Mother Parascheva. 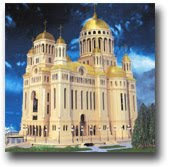 She is especially honored in Moldova, for her holy relics have been in Iaşi for 350 years. Among the people she is also known as “Holy Friday” or “Great Friday”. St. Parascheva lived in the first half of the 11th century. She was born into a Christian family in the village of Epivato in Thracia near Constantinople. It is said that at the age of 10 she heard the Savior’s call, “Whoever wishes to follow me, let him deny himself, take up his cross, and follow me” (Mark 8:34). She began to deny herself, giving away everything she had to the poor. Then she followed the path of withdrawal from the world, heading out first for Constantinople, then for a monastery in Pontus, and later to the wilderness near the Jordan in the Holy Land. In his Book of Homilies, published at Iaşi in 1643, Metropolitan Varlaam of Moldova says that from this time on, Parascheva “no longer cared about clothes or beds, neither food nor meals, neither house nor servants, but only about the purity of her soul and the response she would give at the coming judgment”. At the age of 25 an angel revealed to her in a vision a call from God to return to her homeland to prepare for her death. And, in obedience to the vision, she returned to her village of Epivato, passing on from this life unknown to anyone. But God saw fit to glorify her. Miraculously, her incorrupt and fragrant body was discovered and placed with honor in the Church of the Holy Apostles in Epivato. Her holy relics remained for about two hundred years in Epivato, after which they were moved first to Târnovo, the capital of the Romanian-Bulgarian Empire, then to Belgrade, then Constantinople, finally arriving in Iaşi in 1641, during the time of the ruler Vasile Lupu. Since that time, St. Parascheva has protected Moldova and brought comfort to those who venerate and kiss her holy relics with faith. The life of Venerable Parascheva doesn’t seem to have had any sensational aspects. And yet her holy relics prove that she was a saint, for she lived a life dedicated to God, giving up this earthly life in order to gain a heavenly life. She lived unknown to men, but known by God. She lived a short time on this earth, but she gained the eternity of those who are close to God. She listened to the Savior’s calling to follow Him, and she proved through her life that whoever lays down his or her life for Christ and for the Gospel will save it (Mark 8 :35). It is proper and right for us to honor St. Parascheva, and to reflect with attention about what we want to do with our life, to understand that we must seek the path to the salvation of our own souls. On October 14 of 2009, we have opened the Museum of Selim Pasha with a group of volunteers from Kadir Has University (www.khas.edu.tr) and we would like to organize the Museum to honor St.Parascheva who was born here and helped all around in healing them with medicinal plants (still around) and we would like to collaborate with you all to make the museum to fit her gentle and noble spirit. I will send you an e-mail very soon. Thank you for your nice thought! Dear Mirel, Could you write to me @ my regular email in reference to St.Paraschiva & Dr. Aynur Unal ? My email is st.paraschiva@gmail.com , my name is Berney Foley. Thank you. Hello Berney, what do you want to know? Hi, I never realized you answered me here. I apologize for the time between our correspondences. Thank you. St. Paraschiva means a great deal to me, did Dr. Aynur Unal ever update you on the museum ? Is there any info. you can share with me on this matter ?